So maybe I’m strange, but I enjoy bringing cookbooks to school with me. I sit in between classes reading my newest cookbook. I read it in the car on the way to and from school (don’t worry, I’m not the one driving!). Anyways, so I brought the Veganomicon with me one day and as we drove home from school I found this recipe. It stood out because roasted garlic is 1. super delicious and 2. super easy to “make”. 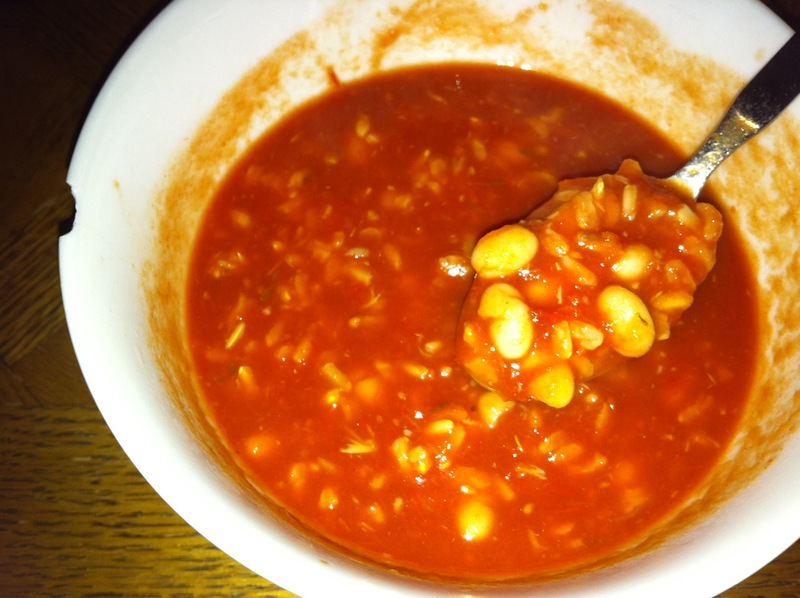 I also love tomato soup and legumes (especially kidney beans). I finally gathered the ingredients to make this soup though I had a really difficult time finding thyme. I ended up having to borrow it from someone. 1 15-oz can of navy beans, drained and rinsed. Preheat your oven to 425F. Roast the garlic by cutting the top of the bulb off so that the cloves are exposed. Drizzle olive oil onto the garlic and wrap it in tin foil. Once the oven is pre-heated, put the tin-foil clad garlic bulbs into the oven for 45 minutes. The garlic should be soft afterwards. Preheat a soup pot on medium heat. Add olive oil and onion. Cook until onion is translucent (5-7 minutes). Once onion is cooked, add the rice, bay leaves, pepper, salt, thyme, and marjoram. Stir for two minutes and then add the two cans of crushed tomatoes. Once you put in the tomatoes, fill each can of the tomatoes with water and dump the water into the soup pot (for a total of 56-oz of water). Bring the soup to a boil and then turn the heat to medium-low. Cover the pot and allow the soup to simmer for 45 minutes. Once your garlic has cooled down enough to touch, squeeze the cloves out of their skin and into a small bowl. Mash the cloves with a fork to get a smooth consistency (relatively smooth!). The garlic should really just “pop” out of their skins (i.e. no effort). Once rice is nearly tender, add the garlic. After the rice is cooked add the navy beans and heat through. Once beans are heated, serve! This recipe was relatively simple. I ended up making the roasted garlic the night before I made the soup because it was late and I was too tired to cook. I wanted to add more beans to the soup (kidney beans!) but my boyfriend nixed the idea. This soup was tasty though! I enjoyed it. It just… needed a kick of some type. I really couldn’t tell you what it was though. Maybe some spiciness? It makes a LOT of soup though, so be prepared to have left-overs! My dad froze the soup into individual containers so he could just take it to work. In regards to the photo: same old same old. The iPhone is just a million times easier to use than grabbing my point and shoot, uploading, editting. This is one way I actually make SURE that I take photos because I always have my phone with me. I do have a backlog of entries. Be prepared to see: ginger-blackberry trifle, garlic bread, chocolate pancakes with strawberry sauce, and homemade spaghetti sauce.